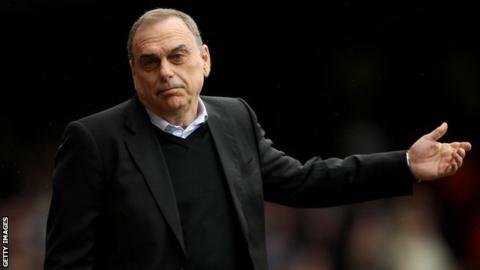 Former Chelsea boss Avram Grant has been appointed the new coach of Ghana. The 59-year-old has signed a 27-month deal to take over from Maxwell Konadu, who had been in temporary charge since Kwesi Appiah left in September. He will start work on Monday and his contract will finish at the end of February 2017 - after that year's Africa Cup of Nations finals. Israeli Grant has only six weeks to prepare the Black Stars for the 2015 Nations Cup in Equatorial Guinea. The Ghana Football Association have given Grant a target of "doing well" at the upcoming tournament and to win the event two years later. GFA president Kwesi Nyantekyie told BBC Sport: "It would be unfair to ask a coach appointed only one month before a tournament to win the trophy. "But he must do well and then the FA will assess his performance after the Nations Cup and determine whether he has done well or not. "Avram Grant is a motivator and an organiser. We needed someone with a certain stature or pedigree who can manage the egos of our players as well as their expectations and those of Ghanaians in general. "He has managed a lot of top-class players, and [coping with high profile players] has been the bane of many African coaches. We believe his quality will turn things around for us." Ghana, who topped their qualification group for next year's showpiece, will find out their opponents in Equatorial Guinea when the draw is made on 3 December. The tournament will be held between 17 January and 8 February. Grant, who as Chelsea boss suffered defeat by Manchester United in the 2008 European Champions League final, was most recently the technical director at Thai side BEC Tero Sasana. His previous coaching role was at Partizan Belgrade from 2012 to 2014, during which time he steered the club to their fifth consecutive Serbian championship. As well as spells in charge of English clubs Portsmouth and West Ham, Grant has international experience having spent four years at the helm of Israel's national side. There had been been concerns that Grant's nationality could prevent him gaining access to some North African countries. Earlier in the week, Nyantekyie told BBC Sport "that is an issue" but says the two parties will deal with it. "The holder of an Israeli passport will not only be denied entry into North African countries, he will be denied into some Arab countries," he said. "He has brought an alternative way of dealing with it. There is a satisfactory arrangement to arrest his threat. Very soon, in a matter of months, we should clear that."